This is my Mom’s recipe, only I added pickles and green peppers to it. My mother-in-law loves it when I put lots of pickles, peppers, and red onion in it. And I didn’t include the parsley this time. Boil the potatoes and eggs. I always put them in the fridge overnight to prevent the potato salad from turning out mushy. Peel the potatoes and the eggs and cut into small chunks and toss them into a large bowl. Add the celery and red onion and toss briefly to mix. Set aside. For Dressing: In a small bowl and using a fork, stir together the mayonnaise, mustard seeds, green onion, parsley, dry mustard, salt and pepper, mixing well. Pour the dressing over the potato and egg mixture and mix well. For best flavor, cover and chill for up to 2 hours before serving. Sprinkle the parsley over the top and serve. Should You Be Compensated For Babysitting Your Own Grandchildren? First and foremost, you need to consider your particular situation when debating compensation for committing to look after your grandchildren. Do you have daily commitments? Are you taking care of more than one child? What are the ages of your grandchildren? Is this a full time commitment? Mix pudding and milk in bowl with whisk about 2 minutes. Layer the bottom of a 2-qt. bowl with half of the nilla wafers. Add layer of 1/2 of the pudding. 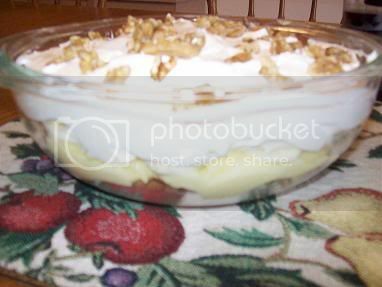 Add layer of 1/2 of the banana slices. Then repeat the layers. Add the cool whip on top. Then sprinkle with the walnuts. Store in refrigerator. Cook pasta until tender. Combine all ingredients in a baking pan or dish except grated cheese, croutons, and parsley flakes. Evenly top with croutons. Bake in preheated oven of 325 degrees for 20 minutes. 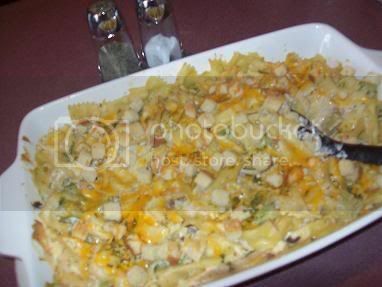 Top with cheese and bake for an additional 15 minutes. Sprinkle a little parsley flakes on top before serving. All too often a lot of single moms feel that they have to be “super mom” and not expect or ask for any help. If you are among the super moms, you run a great risk of parenting burn out. We are all human and we all fall short of “doing it all” at some point. Hey, it’s tough enough raising kids as a 2-parent family. That goes double for single parents, especially single moms raising 2 or more children. So, it is OK to ask for help or support when you’re trying to raise 2 or more kids? It’s not only OK, it is suggested. Remember as a single mom, you have to work hard to bring home the bacon without depending on any child support, whether you are receiving it or not. You never know when that money will run out. You also have to raise your kids to be compassionate and responsible adults. That’s not an easy task in today’s world. For single moms it is quite the challenge. You are responsible for your child’s schooling, the clothes they wear, the food they eat, and also the air they breathe. Let’s face it, anyway you look at it, that’s a tall order for any single mom raising 2 or more kids. For the moms out there that don’t think they are “super mom” and are not reluctant at seeking advice, there are a lot of practical things you can do for support in general, financially or otherwise. * Take good care of yourself – There is so much more to this than one might think. Pay attention to your body and mind. You have to first take care of yourself in order to take care of your kids. Exercise daily. Eat right and drink plenty of water to keep yourself hydrated. Get plenty of sleep. Watch your stress levels and try to avoid it at all costs. Smile, try it! It helps relieve stress. * Join parenting network support groups – These can be in the form of online message boards, support websites, online chat groups, offline support group centers, and your church community. * Start a parenting journal – This will strictly be for you as a parent and should be kept private. Writing in a journal can be quite therapeutic for some people. You can write about specific goals about parenting, anger management, and even special goals for yourself. * Consider a roommate – Save a considerable amount of money on living expenses and have companionship at the same time. You will also have someone to swap babysit dates with. Your roommate will watch all the kids for one day, and then you take your turn at it. Beautiful concept if you are all for having a roommate. Some people like living alone and is a preference. * Always show your love – Of course it’s crucial to your child that they know you love them. But there are special ways of showing your love. Give plenty of hugs, kids love them! Write a special message on a piece of paper and hide it in their school bag or lunch box. Show positive praise. Positive comments and encouragement goes a long way with your child’s self esteem and confidence. * Discipline – Most often discipline is the most sought after advice for single moms. One important thing I have learned personally is controlling anger. If your child sees you angry while trying to discipline them, this gives them leverage to push your buttons even further. If you don’t get a handle on controlling your anger, you are sunk before you even begin. “Stick to your guns” is also a famous motto you should always practice. If you tell your child one thing and then back out on it, what good is discipline in the first place? Use your gut instincts with parenting and stay true to what you believe is the right thing for your children. Tammy also offers work at home articles, free job leads, work at home tips, and more at Work At Home Jobs. 1/4 cup mini chocolate chips (semi-sweet) – I used the standard size, I didn’t have any of the mini sized on hand. Preheat the oven to 350 degrees. 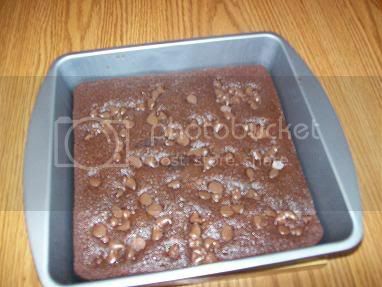 Spray an 8×8 inch non-stick cake pan with spray. In a medium mixing bowl, using a sturdy whisk or spatula, mix the applesauce, vanilla, egg whites and sugar until they are well combined. Add the flour, cocoa powder, espresso powder, baking powder, and salt. Stir the mixture until it is just combined and no lumps remain. Pour it into the prepared pan. Sprinkle the chips evenly over the top. 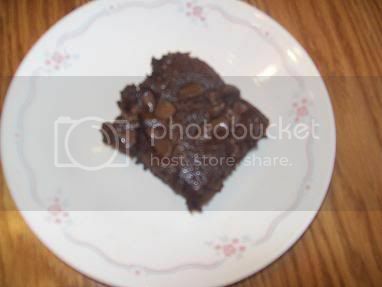 Bake the brownies for 20-22 minutes or until a toothpick inserted in the center comes out dry (a few crumbs are okay). Transfer the pan to a cooling rack and allow them to cool 5 minutes. Cut into 12 equal brownies. Makes 12 (1 brownie) servings. Here are a few clothing items that Baby _____ received below. Our son and DIL WON’T give out the name that’s been selected. They won’t disclose this information until after our grandson is born. In medium bowl, blend together the marshmallow cream and cream cheese until smooth. Mix well. Add yogurt and orange juice, stirring until well blended. Cover and refrigerate for two hours. 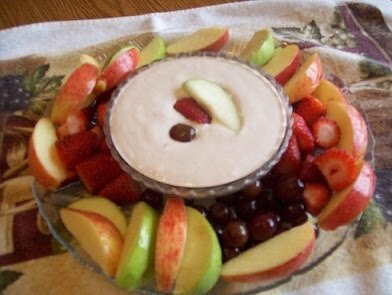 Serve with your favorite fruits. When I was about to be a Grandma for the first time one the first questions (of course the 1st question is she having a boy or a girl) was what are you going to have your grandchild call you. Well I thought it was a silly question and one I never really gave any thought to, it just seemed logical I would be called Grandma. Well was I wrong LOL! During Caleb’s first years I was always referred to as Grandma to Caleb, but when Caleb started to talk Grandma took a whole different direction. For some reason he started to call me Pom, yep Pom. So I was alright with that, if that was what he wanted to call me so be it. Every time he would talk to me “Hey Pom”, “Pom, come here” we would all chuckle and ask each other where in the world did he get Pom from. It was not until my daughter was on the phone with me one day and said “Hi Mom”, that Caleb insisted he talk to “Pom” that was when the light went on, he for some reason thinks I am Mom only with a P.
Well Caleb has now turned 3 and out of the blue Pom has now gone to Grandma, don’t know why, but now it’s “Hey Grandma, “Grandma come here” etc. and even when we talk on the phone he calls me Grandma. Now his Grandfather has always been Pop Pop and that just seems to stick with him, Caleb has always called him Pop Pop and I don’t see that changing and Pop Pop loves his name. So I ask, who decides, it is a family decision or is it the Grand Child’s decision?